So, what exactly is marketing anyway? If you do a Google search for “what is marketing”, the official definition is: the action or business of promoting and selling products or services. Wow, that is broad and general! 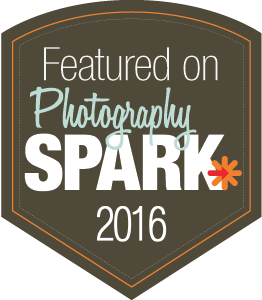 There is a lot of advice floating around the internet about marketing your photography business. However, unless you fully understand the basic concepts of marketing, you are not going to be able to successfully implement them for your business. Marketing encompasses several techniques that all work together to promote your business. 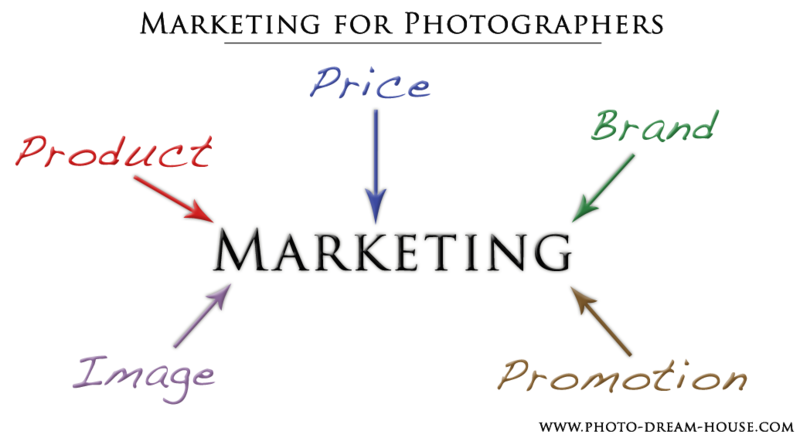 In the current saturated photography industry, marketing your photography business effectively is vital to its survival. But ultimately, what it comes down to, is knowing who your client is. Once you understand your target client, it will be much easier to market your product to them. One last key to identifying your target market is to analyze how large the market is. A quick and easy way to do this is with Facebook by creating an ad. Simply go to your home page, click the gear icon, and select “Create an Ad.” Once you are on Create an Ad page, scroll down to the bottom to “Choose Your Audience.” Play around with that section to see how large your target market is. It’s not completely comprehensive, and it covers only people on Facebook sharing that information. However, it is probably the easiest and quickest way to see how large your ideal target market is. What are the key aspects that work together to market my business? All of these marketing aspects work together to market to your target client. I will cover each of these in further detail below with complete examples. 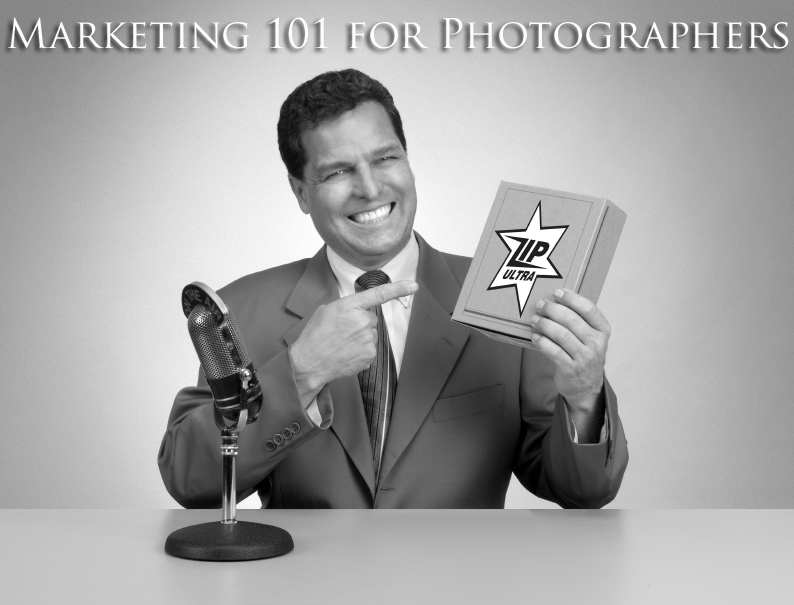 Remember, this is an introduction to marketing for your photography business. This post will give you understanding of the basic marketing concepts, which will then help you create and implement marketing ideas for your business! Basically, your product is what are you selling to your target client. Simple enough, right? 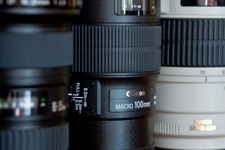 “Product” to photographers means the types of sessions, prints, packages, and digital files you offer. What you choose to offer as your product will attract your target client. For instance, if you want to attract married females with children and a high income and spending habits, you will want to offer more unique and boutique-type products to cater to that market. Offering only one product, a session and disc with images, will not be a good fit for that type of client. Now you have your products, how do you price them. First of all, you’ll want to price them so you are making a profit every time. Everyone wants that, and your business will always succeed if that’s the case. My Photography Pricing Workbooks are one way to ensure you are always charging what you should be for your products. And right now, you can get $100 off the price of each one! It’s the perfect time to check them out if you are starting out your business and don’t know where to start or restructuring your product offerings and pricing. If you aren’t ready to make that investment, mark down the cost of each product you offer, the time you spend on each one, and how much you want to mark it up. How much you mark-up your products also plays a role in marketing to your target client. It would be great if every photographer in the industry could make over $2k per sale. It simply isn’t realistic or feasible. As a consumer, I know I certainly don’t have that kind money to throw around, especially on just one photo session. There is a significant population of people who can’t afford that much or will refuse to invest that much. Basically, the market of people out there who have the ability to invest that much in a photo session is much smaller than the market who will spend anywhere from $400 – $800 per session. Again, it all comes down to understanding your target client! How you brand your business and your products also has a profound impact on attracting your target market. Your business’ brand covers a wide range, including, but not limited to: product packaging, welcome packet, thank you notes, business cards, logo, website design, and business name. However you decide to brand your business, the key to this aspect is consistency. Apple is a fantastic example of branding a business and product consistently. Their brand is white, clean, and sharp. It’s basic, but underneath it offers features that no other brand offers. Everything from how their store is set-up to how they advertise to how their products are packaged match their brand. Not to mention, this branding plays directly into influencing their target client to buy their products. I’m sure most of you reading have bought at least one Apple product (I have 6!). When you open one of their products, how do you feel? Excited? Do you get even more excited to play with your new electronic as you unwrap the delicate packaging of the box? That is their goal of their packaging, drawing emotion and excitement about their product. It differentiates them from their competition, and it makes the client feel good about their new purchase. The branding of your business and products should aim to do the same thing for your clients. This is the one aspect everyone likes to focus on, since it is the most visible and can change quickly. And, there are many, many different techniques to promote your product. Included in this aspect is advertising, sales, referral programs, promotions (duh), and mailing lists. Basically, it is all of the different ways you tell your clients about your products, and then how you sell it to them. Since this marketing aspect is so broad, I will be focusing more on it in future blog posts. Make sure you don’t miss out on those future blog posts by signing up for the newsletter or liking The Photographer’s Dream House on Facebook! What is my Business’ Image? Business image is an aspect often overlooked. Essentially, how do potential clients view your business, and how to current clients feel about your business? Is your website sloppy? Is your portfolio in need of updating? 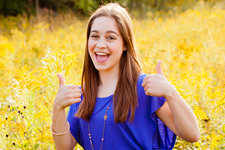 Are you giving your clients good customer service? Are you responding to emails in a timely manner? A big one for the photography industry especially is how you are conducting yourself on photo shoots. How are you dressed? Are you conducting yourself in a professional manner? Are you patient with their kids? If anyone else is working for you, are they conducting themselves in the same manner as you would? It’s all stuff that we think about, but don’t realize how much it factors into our business’ image. Ok, I got it. Now, how do I use all of it to gain more clients? That’s the big question when it comes to marketing: how to use it to gain clients. If you identify and know your target client and build the aspects of marketing around that target client, you will be on your way to gaining more clients. The tough part is how to go about that the right way for your business. No one is going to be able to tell you the magic products to offer, the magic price, or the magic branding to gain clients. That one is up to you, the business owner. However, there are effective ways to promote your product and project a good image of your business in a way where you can gain clients and keep them. That’s what’s coming up next! Subscribe to the newsletter or Like us on Facebook so you don’t miss it! I’m going to give you a simple task to do on your own. Look at different companies and how they are choosing to market themselves. You will essentially do a small analysis on that company. Compare two in the same industry, and see how they market themselves differently. McDonalds and Chipotle? Children’s Place and Gap? Macy’s and Nordstroms? Wal-Mart and Target? How do they advertise? How does is “work” on you? What is their image? What is their brand? Through this analysis, you can come to a greater understanding of these concepts, and you may even spark a marketing idea for your own business!